When a student sees that they have a comment on one of their blog posts it can be very exciting. They feel like someone has left some money under their pillow or something in their Christmas stocking. The comment can be from a classmate, family member or another adult in our learning community. In class we have been learning about how to write an appropriate comment. Here are some things to consider before leaving a comment on our class blog. Leave off your email, your street address, phone number, or school name. Don’t share specifics of your daily routines that involve time or location (i.e. where and when your soccer practice is). Be more formal than you would be in real life, but not stuffy. Include your blog url address so the blogger knows where to find you. Try to fix your spelling mistakes. Use capitals in the right places: people’s names, places, the beginning of a sentence, and on “I” ( no evil i’s ). Writing a sentence in all capitals is like yelling or shouting and it’s considered very rude. Punctuate properly: period at the end of a sentence, space after a period, comma or end bracket. One “!” will do, you don’t need a string of exclamation marks. Remember you are putting your best self forward, so polish your comments. 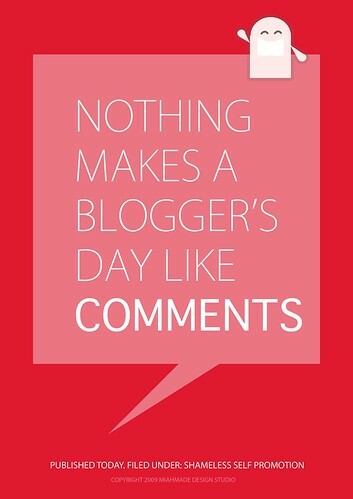 Have fun leaving a comment on our blog! These commenting guidelines were written in early October of 2010 by the bloggers of Huzzah!